Many thanks to everyone who listed their favorite chocolates* in the comments to yesterday's post about Sonoma Scent Studio's Bois Épicés. I ate a lot of chocolate last night while reading the recommendations, and I figured I might as well do a chocolate perfume today. Chocolate is used as an accent note in any number of fragrances, but chocolate "soliflores" (solifoods?) are relatively scarce. There is Aquolina Chocolovers, also Aftelier Cacao, the Temperare Chocolate trio by Yosh, Comptoir Sud Pacifique Amour de Cacao, and a handful of others. Serendipitous by Serendipity 3 is today's subject; it features notes of cocoa, Tahitian vanilla and blood orange. The ice cream parlour Serendipity 3 is something of a New York institution. It was one of Andy Warhol's hangouts, and was used as a location in the films Serendipity and One Fine Day. One of their best known treats is the Frozen Hot Chocolate, a (huge) milkshake made from a blend of cocoas and melted chocolate and topped with a (huge) mound of whipped cream; you can find the recipe here, or buy the mix at La Creme Beauty. They began introducing chocolate beauty products in 2000 with their Chocolate Body Icing lotion, followed by Chocolate Bubble Bath, Chocolate Peppermint Foot Cream, and Chocolatress Shampoo. Serendipitous is their perfume entry. Like the Frozen Hot Chocolate, it will disappoint the serious chocoholic looking for something dark and rich and sophisticated — in my own idiosyncratic system of fragrance families, Serendipitous gets filed under "fun". It opens with a burst of orange and lots of almost-dusty cocoa. The orange hangs around a few minutes, but no more; the dry down is hot cocoa with a good dose of vanilla extract, liberally sprinkled with marshmallows. It is thankfully not overly rich or strong, in fact, it stays relatively close to the skin. The lasting power is a bit under average for an Eau de Parfum (probably closer to what you'd expect from an Eau de Toilette) but that is just as well for me: a few hours is just about how long I want to smell like chocolate. 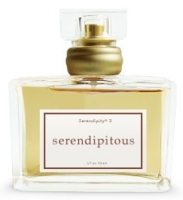 Serendipitous by Serendipity 3 is sold in 50 ml for around $37. For buying information, see the listing for Serendipity 3 under Perfume Houses. A side note: the chocolate beauty products connoisseur in our household is my 8 year old son. His favorites: L'Oreal Kids Cocoa Carousel Smoothie Shampoo (distressingly hard to find! ), Philosophy 3-in-1 in Chocolate Ice Cream, and Palmer's Cocoa Butter lotion. * And a note for anyone looking for obscure chocolate brands in the United States: try Chocosphere; the selection is impressive. Great, fun review, R! I love the frozen hot chocolate at Serendipity. The last time we were there, about four years ago, I had that and bought a bottle of the fragrance for my daughter. We had a lot of fun wearing it for awhile, and then I gave it to a friend. I have Chocolovers and like that one better. The hazelnut note mingles with the vetiver to make it quite pretty. R, I ordered a burger and a frozen hot chocolate on my first visit to Serendipity, and when they came, everything was so huge that I said I'd never be able to eat it all — but I did. And then we went to Dylan's Candy Bar down the street, LOL, and I bought more goodies. And I left off another of my own favorites: Altoids Dark Chocolate Dipped Mints. Yum! I like Chocolovers, too, but have always thought it smelled exactly like wafer cookies, rather than chocolate, per se. But that L'Oreal Cocoa Smoothie shampoo! I must have it. My little one and I have tried the honeydew melon and lavender “sleepytime” ones from that line, and are currently using the Coconut (pleasant and rather fresh smelling for coconut) becuase her hair is dry, but that one sounds fabulous. I will search high and low. Any tips on places you've found it? We have the coconut L'Oreal Kids too, and the strawberry, and the one that promises to remove chlorine and does seem to do a pretty good job. The Cocoa Carousel came from CVS (drugstore chain), and Santa bought it right before last Christmas. I have a feeling it might have been a limited edition (ludicrous!) because I've never seen it on the L'Oreal kids website. The Philosophy is supposed to work on hair too, but I find it leaves his hair like straw so we just use it as a shower gel. I am tempted to order the Serendipity Chocolatress, but honestly, how many high end beauty products should an 8 year old be addicted to? Oh, this was so much fun! I have to go read your chocolate selection. I would love to taste the frozen hot chocolate, too. And “solifoods” cracked me up. LOL at “hides them so she can attempt to eat them later” — that is priceless! I haven't been to Serendipity in years, but I remember fondly those yummy Frozen Hot Chocolates, which were about 15 gallons if I remember correctly. Despite the fact that I usually loathe gourmand, I want to try this.. I see nobody mentioned Tuescher chocolate yesterday. Truly the most divine, if pricey chocky I've ever had. M, Serendipity 3 is great fun, but you have to wait for the pleasure: the line at lunch on a weekend can be an hour or more. Great place for kids though! They are HUGE. I honestly don't know how I ate a whole one with a burger. Looks like Teuscher has a boutique in NYC, will check them out! The champagne truffles look awesome. Another great review, thank you Robin. I do have a bottle of Serendipty. I don't reach for it much,maybe once every few months. It's a delicious smell…not so much chocolate to me as Amour de Cacao…but like you said, a really fun sort of scent. Wylies? No, but I absolutely remember Giffords, and that was the best ice cream parlor ever! There was one on Georgia Ave. not far from the DC line in Silver Spring and one on Wisconsic Ave. in Bethesda/Chevy Chase. They are now both closed, but there's a parlor in Alexandria that sells the ice cream, but I don't know if it goes by the Giffords name. Serendipitous was one of the first fragrances I bought after discovering the MUA fragrance board. I was so tickled that someone made a chocolate perfume. Although I've outgrown it, I do enjoy a spritz occasionally. Once every few months is about as often as I need a chocolate scent myself — a decant of Chocolovers and a decant of Serendipitous would pretty much set me up for the rest of my life…but still haven't even tried the CSP! It was mentioned on the MUA board pretty often when I first joined, as was Lea. Don't see either of them mentioned as often these days. But Wylies was incredible — one of the first to make all sorts of wacky themed sundaes, many of which left you with some toy to take home (thereby introducing young children to the “gift with purchase” concept, LOL). My favorite was an ice cream float that came in a cup shaped like a cowboy boot, and you got to keep the cup. There were also sundaes with plastic bugs in them, etc. That's right! I think I went to that new Giffords about ten years ago. Unfortunately, it was not a big, grand parlor. It looked more like a B-R.
No, you're right. I don't know of any “grand” ice cream places any more. But also, it is hard to make going out for ice cream the special thing it was when we were young — in my freezer right now I've got Ben & Jerry's Americone Dream and Breyers “Cookie Jar Special Edition” — what's the point in going out? When we were little, if you wanted something other than plain vanilla or chocolate, you pretty much had to go out. Re: Chocosphere – the Pralus Pyramide is an experience on par with receiving ten generous samples of deep, interesting, idiosyncratic perfume from ten different niche lines. Single origin chocolate is a pleasure very much like perfume. It would be great if Pralus would start makig perfume the way Coppeneur has! R — I grew up in Arlington, so no, I didn't know Wylie's, but will ask the Husband, who grew up in Chevy Chase and has a vicious sweet tooth. My special ice cream reward as a child was to be taken to the already-mentioned Giffords — which at that time was a formal ice cream parlor (we went to the one on Lee Highway) with waitresses in starched uniforms, a tiled interior, and the best hot fudge I have ever tasted. Giffords has reopened in Bethesda and the product tastes the same to me (I'm very fond of their swiss chocolate), but the ambience is pure B&Js. I miss the old parlor. I can't remember where the Giffords we frequented was located, but yes, it was like that — very “formal” and grand. Wish I could remember exactly where Wylie's was. It was certainly near Silver Spring, but could have been Takoma Park. The ice cream probably wasn't as good as Giffords, but it was a great place. Dana Vigilante writes – I do agree with you. I've outgrown the chocolate scents myself. “Angel” was one of the first perfumes to contain notes of chocolate, and now, I can't stand to be around anyone who has that on. I think “food” scents are great for 'tweens, but personally, I can't imagine putting it on and then putting on my Hermes scarf and Manolo's for a meeting. A bit too “young” for me and not a scent that anyone would take very seriously.